If you like Makita’s Max Efficiency Circular Saw Blades with their improved cutting speed and runtime, you’ll also enjoy the new Makita Max Efficiency Miter Saw Blades. Like their predecessors, these blades enjoy a unique design that results in faster cutting speeds with smoother finishing, thin kerfs, and increased durability. What takes these miter saw blades to the max is Makita’s ATAFR (alternate top alternate face with raker) design. In other words, there’s a right bevel, left bevel, and then flat rake cycle of teeth. The specially engineered teeth alternate cutting face positions and are treated with high-grade tungsten carbide tips. 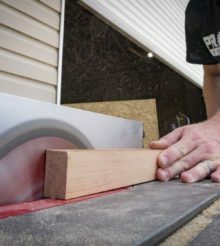 This not only provides smoother cuts, but it reduces the load put on your miter saw while you cut. Part of the load reduction comes by way of the thinner blade kerf as well. This design reduces material loss and produces cuts that require less finish work. It also means less work for your saw to do. In addition to all-around smoother cuts and greater efficiency, Makita tells us this design cuts up to 100% faster than standard blades in a cordless miter saw. But What About Table Saws? At the moment, there’s only one cordless 10″ table saw and Makita isn’t making these blades in 8-1/4″ sizes for the others. Take cordless saws out of the equation and this is still an excellent blade in general, though. So can you use it on a corded table saw? Yes – Makita ran it on their 2705 table saw. Just remember to check the blade’s and saw’s guidelines for the application to make sure it’s the right accessory for the job. Makita already makes some of the best stock blades on the market. They’re one of only a couple we don’t immediately swap out. What’s going to be interesting is seeing how thin Makita Max Efficiency Miter Saw Blades can be without generating more blade wobble than standard blades. Assuming Makita gets the design right, these blades will be an easy upgrade call for any 10″ or 12″ cordless miter saw no matter what color it is.